The approach should work inside the document libraries managed metadata navigation and filtering feature. But none of these approaches work 100% as I wanted.. Choice. Have a good user-experience where users can easily select the keywords + it will work with managed metadata navigation.. But the main drawback is that managing the choices’ options will require admin permission on the site level.. Which is not something I can provide to end users!! Lookup. Also have good user-experience where users can easily select the keywords. And end users can manage the choices.. But the main drawback is that it will not work inside the managed metadata navigation and filtering. Managed metadata. we can define certain end users to be term group contributor, so they will be able to manage the terms + will work well with managed metadata navigation and filtering + if we add new document libraries on another site collection I can still use the same terms (more enterprise solution compared to the other 2 approaches).. but the drawback I found, is that for end users they find it somehow difficult to select terms inside the term selection dialog. So to be honest I find that managed metadata is the closest one, but the problem is that I received many complaints from end users that it is no easy for them to select the terms. And they always say why not to just have a drop-down menu to choose from !!! But can I show all the terms? 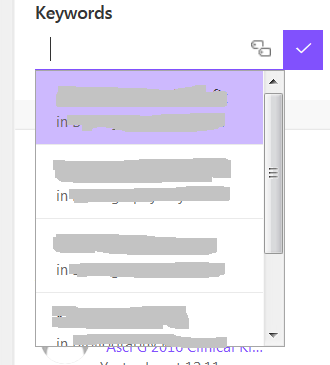 so users can double click on the keyword field and they will get all the terms shown? ?,, instead of having to click on the term icon and then select the terms inside the term selection dialog, which is not very user-friendly !! especially end users cannot see all the available terms inside the term selection dialog, unless they manually navigate through the terms !! Not the answer you're looking for? Browse other questions tagged sharepoint-online document-library lookup-column managed-metadata term-store or ask your own question.